Not only is Dodger scout, Gary Nickels, being inducted into the Midwest Scouts Association Hall of Fame in a couple of days, but he also has had an illustrious career as a print advertising pitchman for State Farm. Check it out above. Also, check out the press release below provided by the Dodgers this afternoon. One thing of special note is that he was the mentor to our guru of scouting, Logan White. Dodger Midwest Scouting Supervisor Gary Nickels will be inducted into the Midwest Scouts Association Hall of Fame on November 7 and the Mid Atlantic Scouts Association Hall of Fame on November 14. The 2009 season is Nickels’ 38th as a scout, and seventh in his current position. Notable current Dodgers drafted under his supervision include Chad Billingsley, Clayton Kershaw, Scott Elbert, Blake DeWitt, Cory Wade, and A.J. Ellis. His scouting territory includes Texas, Oklahoma, Arkansas, Tennessee, Kentucky, Indiana, Ohio, Michigan, Illinois, Iowa, Missouri, Kansas, Nebraska, North Dakota, and South Dakota. The Midwest Scouts Association Hall of Fame induction will occur at the Midwest Scouts Association Banquet at Kauffman Stadium in Kansas City, Missouri. He will be inducted along with Mike Radcliff of the Minnesota Twins and Bill Bryk of the San Diego Padres during the event’s dinner at 7:00 p.m. The Mid Atlantic Scouts Association (MASA) Hall of Fame induction will take place at its annual banquet at Ripken Stadium in Aberdeen , Maryland . Nickels’ name will also be added to the Hall of Fame plaque which hangs permanently at Oriole Park at Camden Yards in Baltimore, Maryland . 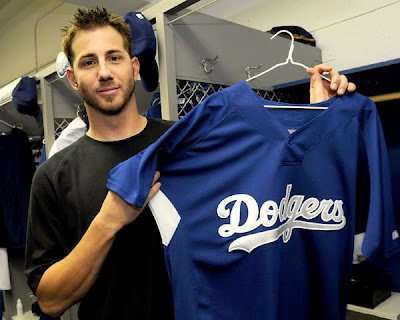 Nickels worked for four clubs prior to joining the Dodgers in 2003. From 1999-2002, he served as the San Diego Padres’ Pro Scouting Director following nine years in Baltimore as the Orioles’ Scouting Director (1991-98) and Midwest Supervisor/Crosschecker (1989-90). He also was the Chicago Cubs’ Midwest Region Supervisor from 1982-88 and got his start in baseball as an Administrative Assistant, Scouting (1972-75) and Area Scout (1976-81) for the Philadelphia Phillies. We get word today that the Dodgers have declined Jon Garland's 2010 mutual option. Read about it here. That's too bad. Garland has always been a dependable innings eater. Since 2002, he has never pitched less than 191 innings. Hopefully, the Dodgers can find some way to ink him to a new deal.